Hey Guys! I’m out-of-town for the next few days this week. As you’re reading this I’m on a plane heading from San Francisco to New Orleans. Crazy, right?! I had to go to San Francisco for a family wedding and from there I’m flying to New Orleans for a work-related conference. I’m hoping I’ll be able to sneak in a bit of shopping whether it be sewing, knitting, or vintage-related. And you can bet your socks that I’ll be hunting for some tasty eats with Felix when I’m not in a conference session. See you guys soon & have a Happy Halloween! Liz! Have you visited New Orleans in the past? I lived there for almost 20 years. If you are looking for something special (especially foodwise) I might be able to help you out. After all, I owe you for all your tips and kindnesses. Enjoy your stay. I still consider it home and miss it all the time. Have a marvelous time and see you when you get back!!! Eat some beignets for me! That’s my favorite part about New Orleans. Fresh beignets for breakfast! Go to the Cochon Butcher! It’s in the warehouse district. There is Cochon, the restaurant (which is delicious in it’s own right) but the Butcher is around the corner and a little more laid back. Magazine street is my favorite area for cute shops. I’m sure whatever you do you will enjoy! 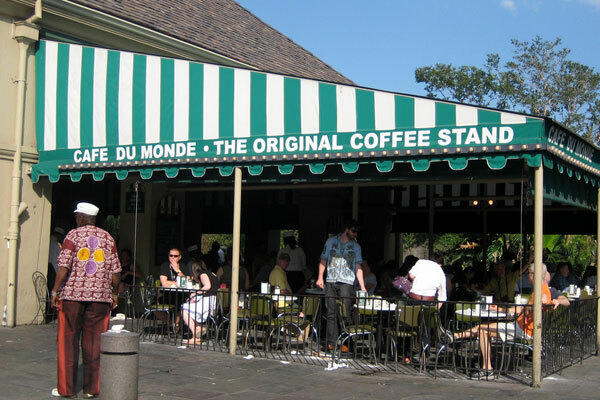 Cafe Du Monde! You absolutely must go there!